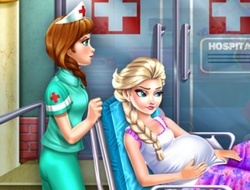 It's time for Elsa to give birth to her beloved child and to do that she went to hospital where she can receive an appropriate treatment for her medical intervention. Come and help her to figure out how to take care of her child in one of this girl game. This game can be also put in the category of elsa games and baby games because it tests your parental abilities and train you for difficult situations. You have to clean and weight the baby, to inject him with some vitamin and see which blood type he has. After you deal with this medical issues you'll have to breastfeed him and give him all the love he needs. Make sure you have fun while you practice for being a future mother. Elsa Birth Care 0.00 between 0 and 10 based on 0 votes.